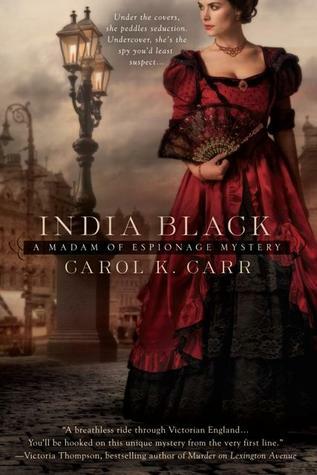 When an important figure in the Disraeli government dies in a compromising position at the Lotus House, Victorian Madam, India Black has to act quickly to avoid any disruption to her business and reputation. Calling on the dubious talents of the odoriferous street urchin Vincent, she has a plan to remove the body discreetly, but is interrupted by government spy French. Blackmailed with the threat of losing the Lotus House she is drawn into his world of espionage to serve the British government. It seems her “punter” was carrying important documents that put the government in a tricky situation with the Russians and they’ve gone missing! India and French end up in the most unlikely situations to save the day! I bought this book hoping it would fill the huge hole left by my favourite Victorian female characters. I worship Amelia Peabody, love Lady Julia Grey, wait for the new Parasol Protectorate books with excitement and even read Emily Ashton (although they’re not my favourites!). I enjoy my strong, clever, sarcastic characters that thrive on disaster, near death and criminal activities. The other important factor in all these is also the strong, devastatingly cool and handsome male interest (who can blame me?!). So India Black, slightly different background to the others and I wasn’t at first convinced that it’d work, but despite my reservations (and I still think it referred to her professional activities a little too much and unnecessarily, which is why I docked half a star!) I really enjoyed it! India has a high regard for herself and her talents, but the overall tone is light and humorous. French (we don’t find out his first name!) is suitably intelligent, devious and handsome, (yay!) but remains fairly mysterious. Not quite a Brisbane, but he definitely has potential! Although India acknowledges his looks and there is a spark between them, this first in the series doesn’t go down the romance route, which is probably better for future books if it develops into a long running series. Vincent, although thinly sketched, I’m sure will develop into a far more interesting character and some of India’s more colourful work colleagues and acquaintances will just have to reappear in later books. To sum up…it’s a fun, fast paced read with strong lead characters. The cover is also really pretty, but a bit too “romance” for the style of the writing. I’ve already bought the second book and although it hasn't completely stopped me wishing for many more (and immediate) Amelia and Julia books, I found it a really enjoyable read. Give it a go! I've just finished the second in the series and enjoyed that too! In my mailbox...half term treats!